There are a whole lot of things to keep in mind when designing the inner content of your cookbook. Here are some of the most important. Most books use full-justification on their text. This makes the line go to the end of the page and spacing or hyphens are added to help with the various line lengths. Many books will also use automated hyphenation to help create more proper spacing. Ultimately the decision comes down to personal preference. Below are examples of left-justified text and full-justified text both with and without hyphens. This is standard left justified text. You can see how jagged the edges are but the spacing between letters is consistent. Using automated hyphens helps reduce the jaggedness between lines. The spacing between letters stays consistent. Moving to full-justified text completely eliminates the jagged lines. Without using hyphens can result in noticeable spacing between letters, especially when there are multiple long words on a single line. Full-justified text with hyphens minimizes the differences in letter spacing while still eliminating the jagged edges. Books should have only one space after a period. Many people are used to using two but the majority of fonts are set up to look best with only a single space. It's easy to do a search and replace on ". " at the end of the book writing process. Many books take advantage of a first line indent, which is simply indenting the first line of the paragraph. This is a personal preference and isn't standard. Bleed refers to the edge of the images or backgrounds extending all the way off of the page of the book. It's a common way to add design flair and full color images to books. I currently do not use bleed for my photos, only for my cookbook covers. In general, I think books with bleed look nicer but it's a more design intensive approach so I trade the gains in better design for the time savings. The impact of bleed is also reduced in black and white, which is how the majority of my books are printed. Make sure you take advantage of the styles functionality in your word processor. If you do all of your formatting using styles you can easily update all the text in your document at once, instead of doing it manually for each one. They behave very similarly to CSS styles and carry many of the same advantages. Spacing between paragraphs should always be a single line break. If you want larger spaces between paragraphs or headers it should be accomplished using the "Before Paragraph" and "After Paragraph" spacing. Resist the urge to simply use two line breaks to space your paragraphs. 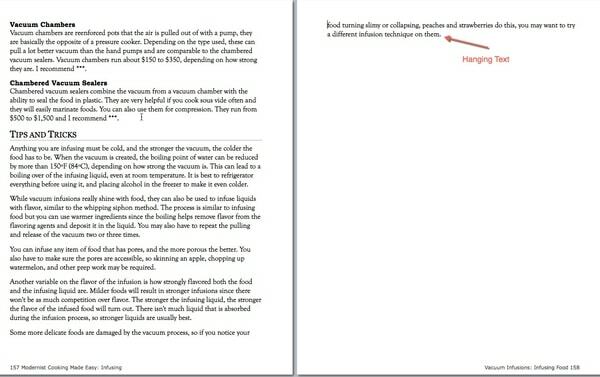 Using a single line will allow your word processor to accurately add and remove spacing at the top and bottom of pages, resulting in a much cleaner document. This also allows you to easily tweak the spacing between elements, especially if you change fonts at a later date. The margins of your cookbook are dependent on the size of your book and your publisher but most guidelines are between 0.25" and 0.75". Our books tend to use 0.75" for the inside margin, 0.5" for the outside margin, 0.5" for the top, and 0.4" for the bottom. Some combination of page headers and page footers are often used. 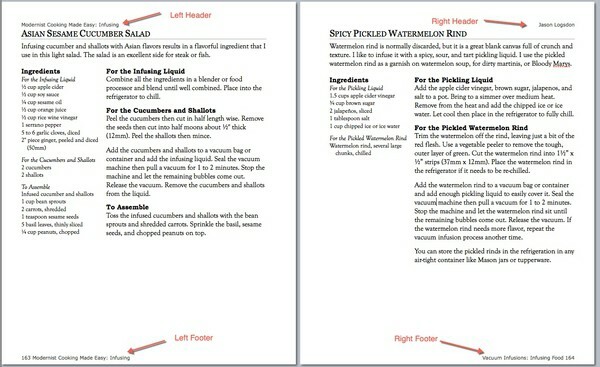 They are the text at the top or bottom of every page, and can be customized for both left and right pages. These are optional and when present usually consist of some combination of the name of the book, the author, the chapter you are in, the section of the book, and the page number. I only use page footers in my books to save more room for the body text. I have the page number and book title on the left pages and the book chapter and page number on the right pages. Numbering the pages in your book is almost always a good idea. The page numbers are usually present in the header or footer for each page. Most word processors have a specific feature where you can insert the page number (in Pages it is in the "Insert" menu, called "Page Number"). Most books start their page numbering at chapter one, and either use Roman numerals before then, or leave off page numbers. A section is a layout term used in word processing. 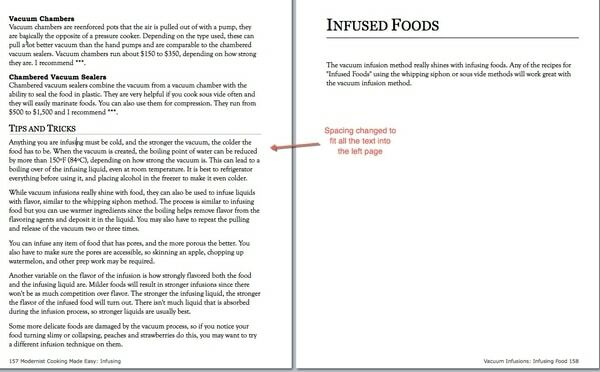 It allows you to have a separate layout for a different section of the book. This allows you to have different headers and footers in those sections, which is key for using chapter names in them, or to control how the page numbering works. Hanging text, or "widows" are lines of text that are alone on another page. This is usually less than two or three lines and looks unprofessional. Once all the text for the book is done and the figures and photographs are in, one of the last things to do is remove the hanging text. This can be accomplished by re-wording phrases on the previous page or changing the kerning or line spacing for the text.